I have a four year old son who is full of life. Actually I have 5 sons, four of them are VERY active and energetic. Sitting still for a photo session just doesn't work. I've learned that if I want photos of these boys, especially as a toddler/young child, it's got to be fun! Below I've listed 3 ideas that are implemented during a child's photo session with Sparrow's Flight Photography. I love to let the little people play. First off it helps them relax. Above my son was warming up to his photo shoot. We went to the woods and he started by hugging the branch and then started to swing on it and then we got this... love that nixie smile. 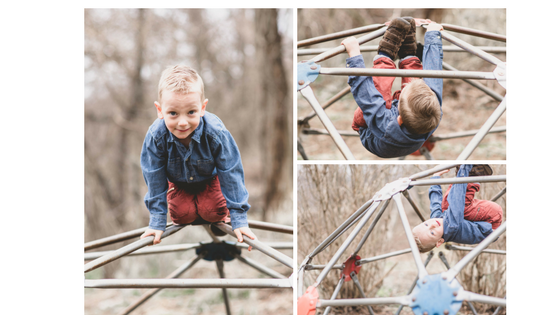 My son saw this climbing structure and instantly wanted me to take his photos there. Sometimes kids have really good suggestions! And even if none of these photos make it to the wall, showing him that I value his opinion opens the door for him to be more compliant when I ask him to stand or sit some place that I think would make a good photo. Once they get use to me and my camera, I love to let kids be silly. You really get some great personality shots during silly times thru out the session. Allowing them to be silly also gets some of that nervous energy out and then they are more willing to focus when you need them to be still. Ultimately, my desire is that I will be seen as safe person. If I am to get photos of your child looking relaxed and enjoying life, then they can't be afraid of me. Otherwise their photos will look stiff and posed, frozen smiles in place. By keeping these three things in mind, it helps the kids (and parents) relax and THAT is when we get those beautiful organic emotions captured! To find out more about a photo session with Sparrow's Flight Photography click here or get your client guide by clicking here.